The bicycle-sharing system allows you to borrow and return bicycles at any of several “cycle ports” (bicycle borrow/return locations) within the community, typically on a 24-hour basis. This program started in Shinjuku City in October and is also available in Chiyoda, Chuo, Minato and Koto cities. If you register as a member, you can use any of the cycle ports in these communities. 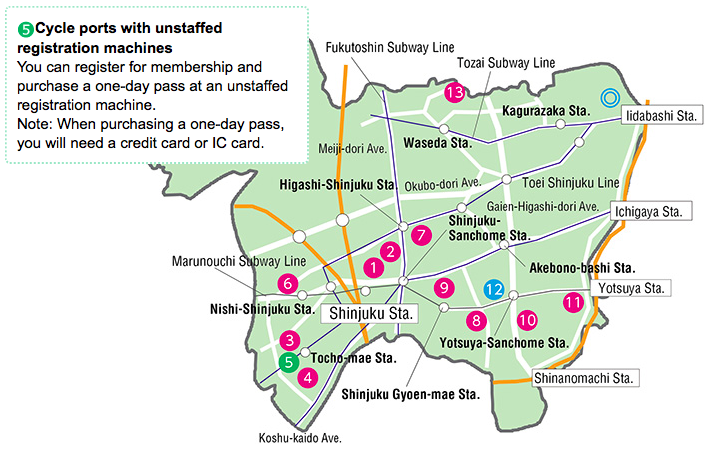 The DoCoMo Bike Share/Shinjuku City Bicycle Sharing website (http://docomo-cycle.jp/shinjuku/en/) offers more information on how to use the program. Note: The one-day pass can be purchased only at unstaffed registration machines (see below ❺) and one-day pass vending machines (see below ◎⓬) and do not require membership registration. The fees listed below can be paid with the credit card, etc., that you list at the time of membership registration. 1.First of all, complete membership registration. You can register with your mobile phone and other devices at any time, anywhere. Press the “Start” button on the bicycle’s panel and then touch your IC card to the panel to unlock the bike. 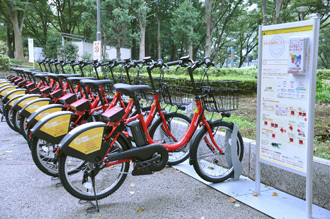 Note: If you do not have an IC card: Enter the bicycle number you wish to use in the designated website when using the program, then input the four-digit number passcode you receive on the panel to unlock the bike. Lock the bicycle manually. Press the “Start” button and cover the panel with your IC card to unlock again. You can return your bicycle to any cycle port. Simply lock the bike and press the “Enter” button. The cycle ports available now are listed below. More are coming—there will be twenty or more in Shinjuku City alone by March 31, 2017. For information, including the latest on new cycle ports, please read the designated website or the leaflet available at each cycle port. There are staffed vending locations where you can purchase a one-day pass at Flexstay Inn Iidabashi ◎ (3-26 Shin-Ogawa-machi) and this cycle port ⓬. 1. You cannot borrow or return bicycles at Flexstay Inn Iidabashi. 2. When purchasing a one-day pass, you will need to show documentation to verify your identity (such as a driver’s license). Besides the basic fee, there is aseparate fee of 500 yen (not including tax) related to registering your IC card.